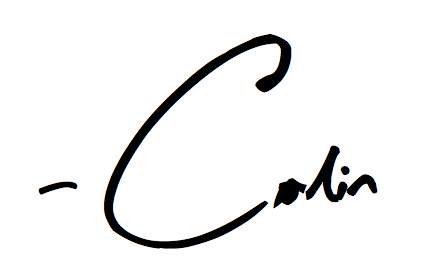 When I met Colin I knew he was destined for great things. He is authentic, funny, engaging, and knows how to connect with his audience. He is living his passion and dream. 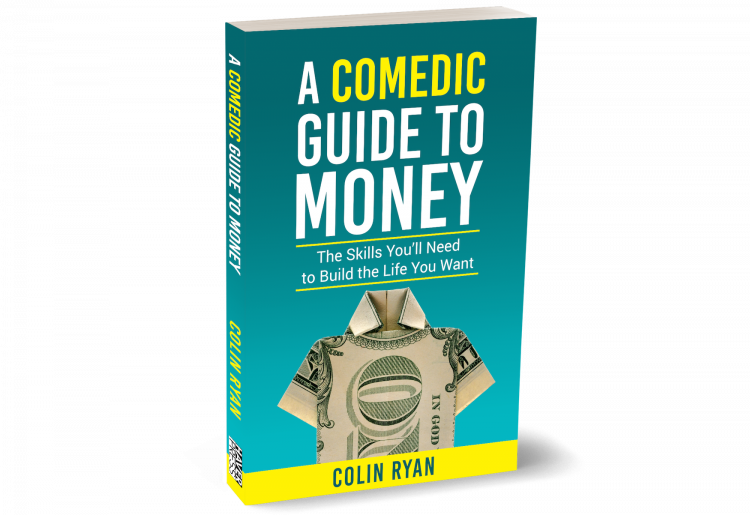 If you want a humorous and realistic approach to handling money, this book is a must-read! It is vital for everyone to increase the power of their financial knowledge in order to make the right choices and decisions for them. In this book, Colin provides the knowledge and tools you need in a way you won’t soon forget! Despite having a fearful relationship with money, this book gave me confidence that dealing with money isn’t as daunting as it seems. An easy, casual, not-at-all-grueling guide to making the most out of my life financially. This book is an easy way into the world of money. Plus it’s funny, which alleviates the stress and stigma that surrounds money. Among the hundreds of clients I coach each year, one thing shows up every time: their understanding (or lack thereof) when it comes to money. Facing fear and saving money have not only been the backdrop of Colin’s life story, but of every one of my clients’ stories as well. There has not been a book that better tackles the subject of money and our shame around mismanaging it than ‘A Comedic Guide to Money.’ Colin Ryan offers us a vehicle to make immediate change in our habits and our relationship to money, and to find the freedom we all crave. 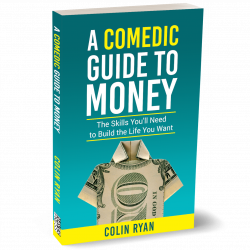 In this book, Colin has poured his heart out and deconstructed what others have deemed a complicated subject, all to provide you with the HOW and WHY of building a better relationship with your money. 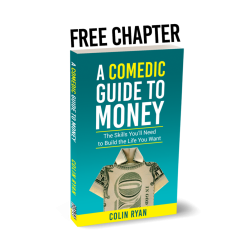 My friend, open this book and allow Colin to be your personal guide on how to master your money! Paves a clear path to avoiding debt, saving money like a pro, and seeing money as a little less intimidating. Most people don’t think about money being a funny topic. And yet Colin Ryan has taken this extremely important subject and translated it in digestible, relatable and humorous fashion. This is the money book that you will actually finish reading! As a parent of two teenage boys, I was anxious to give my kids financial savvy and help them create a solid foundation for their future. But when do teenagers want to hear a parental lecture about the value of saving money?!? NEVER!!! That’s where Colin Ryan comes in. This book is an accessible, practical, useful and FUNNY guide that kids will want to read! This book can change your understanding of money. I know… it changed mine. Also, my dad needs to read this book! A practical gateway guide to personal finance and our relationship to money. I promise not to bore you or depress you, but instead to help you laugh, develop the tools to learn from any tough experience, and come away with real next steps to make your ideal life your actual life. For almost 10 years I've been reading books on finance and interviewing people about how they define and achieve success. What I learned in the process changed the entire direction of my life – the habits people employ and the terms they master to make personal finance work for them. And now I'm going to save you literally thousands of hours by sharing what I've learned in this briskly-paced book. It's full of funny stories and proven behavioral research, and will show you how to build success habits, borrow safely and intelligently, and increase your income. I'm excited for you to read it!